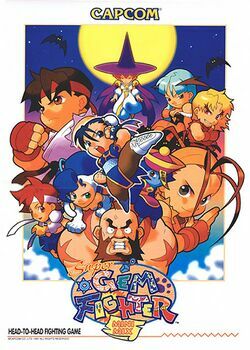 Pocket Fighter (known as Super Gem Fighter Mini Mix in arcades outside of Japan) is an arcade game developed by Capcom in 1997. In Pocket Fighter, twelve characters from various Capcom fighting franchises, including Street Fighter Alpha, Street Fighter III, Darkstalkers, and the lesser known Red Earth game, are depicted in super-deformed, or "chibi", artwork style. Using a simplified fighting system, the game is a light hearted poke at some of Capcom's own successful fighting games. The idea of super deformed Street Fighters didn't originate here. Before Capcom developed this game, they made another game in 1996, entitled Super Puzzle Fighter II Turbo. As the name implies, it was a puzzle game that became incredibly popular in Japanese arcades. It was played head-to-head, and it featured super deformed Street Fighters and Darkstalkers in mock-battles that took place during the competitive puzzle contests. Puzzle Fighter put the notion of these little child-like versions of their favorite fighters duking it out in the heads of players and fans. Pocket Fighter is the realization of that idea. Pocket Fighter borrows another concept from its inspiration, the notion of gems that can be picked up to increase the power of three particular attacks. As players attack one another, gems burst out of their bodies. Pocket Fighter also introduced a system known as Flash combos, which were a sequence of up to four orchestrated attacks that saw each fighter change into various costumes or outfits, often of other Capcom characters. For example, Felicia becomes Mega Man. Pocket Fighter was released around the world for the PlayStation (where the title remained Pocket Fighter despite the different arcade title), and in Japan for the Sega Saturn and the original non-color Bandai WonderSwan. Despite being black and white, the WonderSwan port is said to be spectacular conversion for a handheld system. This page has been accessed 81,907 times.